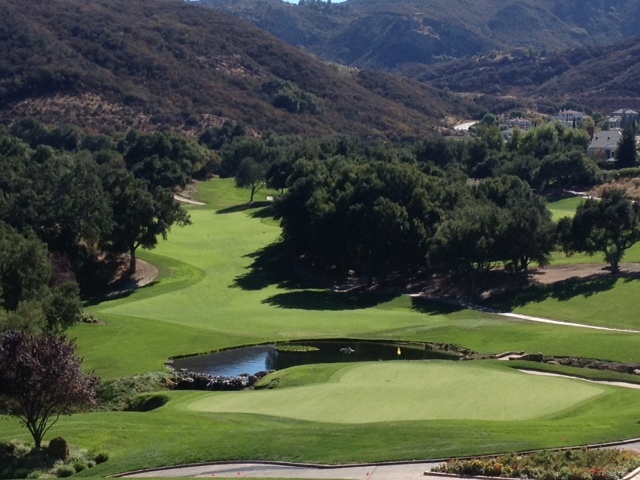 I was fortunate enough to be included in a media tournament on Monday at Sherwood Country Club in Thousand Oaks, where the field for Tiger Woods’ 2013 Northwestern Mutual World Challenge was announced. The tournament, which benefits the Tiger Woods Foundation, will host 18 of the world’s top players, including Woods, Rory McIlroy and defending champion Graeme McDowell, on Dec. 2-8. You can find the full field and ticket information here: http://www.worldchallengegolf.com. This is the 15th year Sherwood has hosted the event, but Monday was my first time ever experiencing it beyond TV. It’s quite a place to say the least and would be well worth the trip just to bask in the beauty of the surroundings and appreciate Jack Nicklaus’ masterpiece course design, much less to experience elite golf. I’ll be writing two or three Sherwood-related posts this week, but wanted to start with this because this is what you see first when you emerge from the clubhouse. What a glorious and impressive site it is, and in one snapshot, it captures all the elements that make this course a mesmerizing golf experience: spectacular mountain views, majestic mature trees, strategic use of visually stunning water features. You get incredible and awe-inspiring combinations of the three over and over here. Oh, and views of a bunch of multi-million dollar homes, too. Probably worth mentioning that. Anyway, No. 18 is a downhill par-4 (we played it at 412 yards, but it’s 446 for the pros) off an elevated tee that plays to a severely sloped green accentuated by a waterfall on the left and fronted by a pond. On your second shot, if you’ve avoided the trees on the right, or the opposite fairway – No. 9 – you’ve likely got a long iron or more into a green that is sloped heavily front to back. The hole has Sherwood’s stately clubhouse as a backdrop. I went driver, 4-iron here and ended up peering down on a front pin with a long, slick downhill put, but I was only too happy to not be in the water. I three-putted, but that the didn’t spoil the fun of executing the approach shots. No. 18 is a stunning finishing hole, whether you’re looking at it from the fairway or the clubhouse, and a marvelous way to end a truly unique round of golf. I can’t wait to go back in December and watch the pros play it. Thanks to the folks at the Tiger Woods Foundation and Sherwood for being first-rate hosts, and thanks to my boss at Southland Golf for thinking to include me. My appreciation goes out to all of you. This entry was tagged Golf course, Graeme McDowell, highlight hole, Jack Nicklaus, Rory McIlroy, Sherwood, Sherwood Country Club, Tiger Woods, Tiger Woods Foundation. Bookmark the permalink.